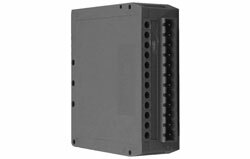 The DMX512 DIN-rail mounted interfaces are interface products that receives DMX512 lighting control protocol and generate various signals to interface with other show control elements. The interface is currently available with three common outputs: dry contact relay closure, open collector optical coupler and DMX512 opto-isolator. Other interfaces such as 0-10V analog, RS-232 may be manufactured on a custom basis.